On the occasion of the Day of Cosmonautics, Vladimir Putin visited the NPO Energomash, where they collect the “hearts” of space rockets. And not only Russian, but also American. The president was told that, at least until 2021, US spacecraft would be sent into orbit with Russian engines, and no Ilon Musk is yet a competitor. To Vladimir Putin was convenient to get acquainted with the development of the holding, all the engines produced over the past few years, gathered in one small room and supplied with information signs. Without them, to understand the intricacies of craters, cones and wires to the uninitiated really would not be able to. The gray-haired scientist almost fell off his chair when one of the operators confused the RD-180 with the RD-181. Both of them are delivered to America, but to completely different recipients and for different purposes. Recently, Ilon Musk tried to prove that the new Raptor engine developed by his company managed to surpass the RD-180 in a number of indicators, so America will soon not need the products of its Russian colleagues. But at Energomash we are sure that the self-taught inventor confuses God’s gift with scrambled eggs, and the real competitor to the Russian engine will not appear soon. 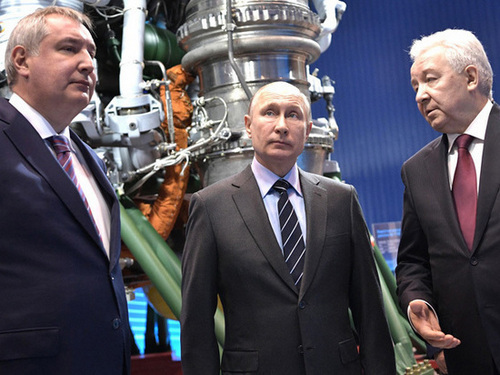 Dmitry Rogozin, as promised, showed Vladimir Putin the most powerful liquid unit in the world (RD-171MB), which the developers themselves call the “king-engine”. It should launch the Soyuz-5 rocket into orbit, the first test flight of which is scheduled for 2022. And then it will become the engine of the first stage of a super-heavy class launch vehicle designed for the exploration of the Moon and near-moon space. Most countries are planning to create such a rocket by 2025, but Russia will probably not be in time before 2028. According to the president, in order to be in trend, designers must create “digital twins” of their designs. “The current production cycle of the engine is 5–6 years, and in the figure – two times less. After that, the product can already be put into commercial use. Digitization is a general trend in all industries today, ”Putin said. He promised that the state will find another 5.6 billion rubles for new projects to create rocket engines. “They will be taken from additional oil and gas revenues,” the president specified. Employees of the enterprise themselves hoped to solve the accumulated everyday issues with the head of state – these are difficulties in obtaining housing and too expensive travel on a toll road (Energomash is located in ever-busy Khimki). Putin admitted that the concessionaires with foreign participation, exploiting the highway, most likely will not succeed. But you can try to talk about the preferential fare with the governor of the Moscow region Andrei Vorobyev present here. On the solution of the housing problem, the GDP promised to talk to the government: one of the possible options is to subsidize mortgage rates for young scientists. In addition to engines, Roskosmos decided to boast to the head of state a line of its civil products. Here were modern low-floor trams and unmanned combiners equipped with robotic “vision”, and artificial intelligence that can identify people with deviant behavior in a crowd to prevent fights and suicide. However, Vladimir Putin probably should have liked the development under the name “Gosudarevo OKO”. So in Roscosmos called the system of operational control of industries with the help of data obtained from space. Now it has more than 3 million square kilometers of space imagery of various objects – agricultural land, forest reserves, large infrastructure and industrial construction sites, landfills, etc. Comparing new images with old ones, “OKO” can track how decisions of municipal and regional authorities are implemented (for example, for eliminating landfills, using a forest fund, etc.) and evaluate the activities of governors impartially. “It’s absolutely useless to argue with Gosudarev OKOM,” the developers assured the head of state.